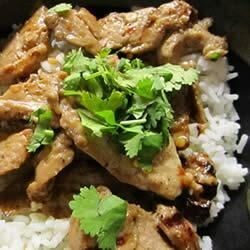 "Thin strips of pork tenderloin are marinated in garlic, soy sauce, and fish sauce, and then grilled and served with a spicy sweet and sour dipping sauce." Freezing the meat for 30 minutes makes it easier to slice. The sauce in particular was very good. I just sauteed the pork in a pan because I don't have a grill, but it still turned out very well. My family raved about this meal. The sauce is one of the best I've had. I used olive oil in the marinade but that is the only change I made. The marinade for the pork was delicious. I don't have a grill so I stir fried the pork after marinating it and a 2 lb tenderloin was gone by the end of the night. This was sooo good. I marinated veggies with it and they just completed the meal!